It is a good sign when a book doesn’t fit into an obvious category. It is probably a nightmare for a librarian or a bookseller, but it is good news for the reader. There is less risk that you are going to read the same old stuff you have read before – we all enjoy the unexpected. Black Swan is one of those books defies classification. Is it philosophy, business, mathematics or history? What it is about unexpected events which unsettle prior conceptions. So that is promising, an unpredictable book that deals with the unexpected. Lets read on. The name comes from an example of the unexpected. Up until relatively recently swans were thought to only come in white. 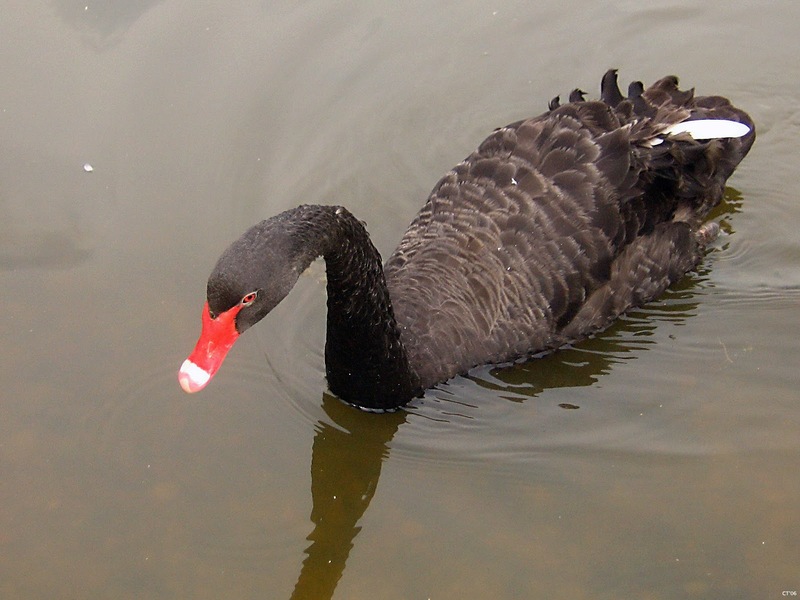 Whiteness and swans were so closely linked in everyone’s mind that it was a complete surprise to biologists, bird lovers and compilers of natural history books when explorers in Australia turned up with a black one. The point being there was no way that that the existence of a black swan could have been predicted. It just happened that one day out of the blue somebody found a black swan. The story of swan colour could never be the same again. The Black Swan is a metaphor for all the things that happen that nobody sees coming. Although we can’t, by definition, know what kind of unpredictable event is going to happen we can be sure that it is the currently unpredicted news stories, technological developments and cultural shifts that are going to have most effect on the future. Nobody saw the attacks on the World Trade Centre coming. Nobody foresaw the impact of the Internet. The most important information we need to predict the future is exactly the information we don’t and cannot possess. What is our reaction to this? Basically, we behave as if the future is predictable and nothing out of the ordinary is going to happen. Taleb’s background is in financial trading, where he made a lot of money. He does explain how he did it but not in much detail and not in such a way that anyone could work out how to do it themselves. (Or at least I couldn’t.) But it doesn’t seem like money is the thing that drives him. It is desirable to have enough to be able to tell others to go away (I paraphrase there) but not much use beyond that. If the book is anything it is a sort of philosophical autobiography. We get to hear about Taleb’s life growing up in the Lebanon. His grandfather was a leading member of the government who apparently had no idea what was going on. At that time the country was coping with a bloody but unexpected civil war. His driver also did not know what was going on. But he had an advantage over the politician. He did not think that he knew what was going on. It was the driver who had the more realistic viewpoint. From the Lebanon Taleb’s trajectory takes him into business where he associates with traders who are also notable for being unaware of the key characteristics of the world in which they operate. Having made his fortune his new companions are academics who like his previous acquaintances are largely clueless but who have refined their ignorance into highly precise forms and disciplines. These effectively insulate their owners from their inconvenient inability to predict anything of any significance. Along the way we get introduced to Taleb’s favourite heroes and villains. Sextus Empiricus is an early hero from the Classical world. He was a leading exponent of the skeptical Greek medical practitioners who vowed to repudiate theories and get on with simply treating their patients. The point being that if you have some kind of preconceived idea you have a natural tendency to fit the facts to the theory. This is can lead you way off course and potentially kill your patient. Sextus was never as influential as other ancient writers on medicine but he has had the last laugh. Today evidence based medicine is back in fashion and in the UK the National Institute for Clinical Excellence (NICE) is applying empirical rigour to the results of clinical trials to replace romantic notions of what ought to work with hard facts. Needless to say, not everyone is happy. Taleb calls this the narrative fallacy. And I don’t think there is a human alive who at some time has not fallen for it. We all have imaginations that can run wild and create elaborate stories from the smallest amount of information. In fact, the less information the better the stories we can come up with. The man who Taleb finds most fault with for this kind of thinking is Plato. Plato conceived of a God whose mind was so perfect that he could create ideal forms in his head. The world we actually live in is just a shade of the true world of perfect forms. These perfect forms, such as completely round and mathematically beautiful circles or ideal abstractions like virtue and truth have held a huge sway over our minds ever since. Men have devoted their lives to trying to get from the base and messy world they actually live in closer to the idealised Platonic perfection that must exist somewhere. But it just isn’t true. A particular bugbear is the highly Platonic habit of trying to use mathematics to describe the way the world works. Mathematics, handy as it can be for some problems, does not describe the real world in any way that carries any more truth than any other. G.H.Hardy the once famous but now neglected British mathematician is quoted with approval. Hardy wrote a popular book called the Mathematician’s Apology which in the seventies could still be found in paperback form on sale in newsagents, but is no longer talked about much. This justified mathematics not as being powerful and significant, but as being beautiful but at the same time useless and harmless. It is not a notion that would appeal to a modern economist who knows calculus better than a physicist and who confidently assesses risk with numerical precision. That this approach leads not to truth or prosperity but to financial disaster is obvious to Taleb, writing just before the recent financial crisis broke. It is the people who misuse mathematics that get taken to task. Taleb has nothing against mathematicians themselves. In fact the person who gets the most glowing praise is Benoit Mandelbrot, the man who invented Fractal geometry. (He also wrote another one of those books that can’t be fitted into a category, see my review of his Fractal Geometry of Nature.) Mandelbrot’s descriptions of chaotic behaviour, whether of weather systems, radio signals or financial prices provide another source of black swans. Strictly speaking these form another category. The classic black swan is something that has no precedent and cannot be predicted by any prior knowledge. In chaotic systems it is not possible to predict behaviour in any realistic sense, but nonetheless you do have some understanding that something might happen. Weather forecasting is a classic example. The turbulence in the atmosphere results from well known and relatively simple physical laws. You can be well aware that these enable a storm to happen. But whether that storm will be tomorrow or two years from now is entirely beyond prediction. Mandelbrot’s mathematics seemed to have suffused his entire outlook on life, and we see him in his study digging out an obscure work by a not particularly well known scientist and praising its insight while dismissing the efforts of authorities with great reputations. Knowledge and understanding themselves seem to be allocated in a confusingly fractal way with no obvious pattern no matter how much we might crave one. People who try to reduce the world to mathematical formula are not just wrong, but are also a menace. A major villain singled out is Robert.C.Merton, the Nobel winning co-founder of the amusingly poorly named Long Term Capital Management. This company’s actual history better justifies calling it Short Term Capital Mismanagement. The scheme was to use the incredible power of prediction of an equation derived originally from Gauss but refined to fit the particular needs of the financial markets. This enabled the skilled practitioner to predict risk accurately enough to profit whatever the market conditions. The promise of amazing rewards had investors competing to be allowed a share of the action, so certain did prospects seem. A couple of years of extremely profitable trading were followed by unprecedented losses of a scale large enough to threaten the stability of the whole system. Needless to say, a major bailout ensued. The system’s brush with death took place in the closing years of the last century. But the lessons of the collapse of Long Term Capital Management were not only not learned, but similar approaches became more widespread. Black Swan had barely hit the shelves when the markets successfully upstaged its most dramatic story. But there is no real need to rewrite the book. It is clear enough that the financial meltdown itself, and the reaction to it, would be no surprise to its author. He is also probably not unduly worried about it either. This book is above all like having a conversation with an educated, intelligent and erudite friend who refers frequently to his equally clever friends. It is an enjoyable experience and you learn a lot and feel better, and maybe a little cleverer. In a random and unpredictable world, I can think of no greater recommendation. It was quite a surprise to find Taleb's book here – a nice one, too. I've read and reviewed it once upon a time (not is such depth as you) and rather enjoyed it. Glad you liked it Bookworm. My editorial policy is simple. I review books that I read and find interesting. I stretch the definition of history quite long way. I don't consciously avoid popular rubbish, that is just the way it seems to have turned out.